For cigar enthusiasts who love to celebrate the finer things in life, smoking is a hobby and not a habit. Exploring the ‘unexplored’ can inject a bit of surprise into established experienciences in terms of taste, feel, and impact. It goes without saying that creating innovative spirit and cigar pairings is a way to continue that discovery into what has kept cigar enthusiasts enchanted with endless possibilities for years. Finding this relaxing oasis in the incredibly busy and bustling fashion district of Harajuku is a feat in to itself. This cigar lounge is two stories underground with only a small sign and an even smaller doorway. Its half a block off the main thoroughfare that makes up the Harajuku District, also known as the fashion hub of Tokyo. Let me just say the people watching here is of epic proportions! The Maldives are know for their bewitching beauty, world-class luxury, and the promise of uncompromised peace making it a perfect destination to unwind, re-discover your original spirit, and connect with Mother Nature. The African Safari has evolved over time to assume a new identity that suits the needs of the modern day tourists who seek to combine adventure with luxury. As a society we gravitate toward cutting edge creations and the automotive industry is no exception. Highlights from the North American International Auto Show are shared here! Upon first look the wrapper of the Hoyo de Monterrey Grand Epicure Edicion Limitada is a perfect and even coco brown. 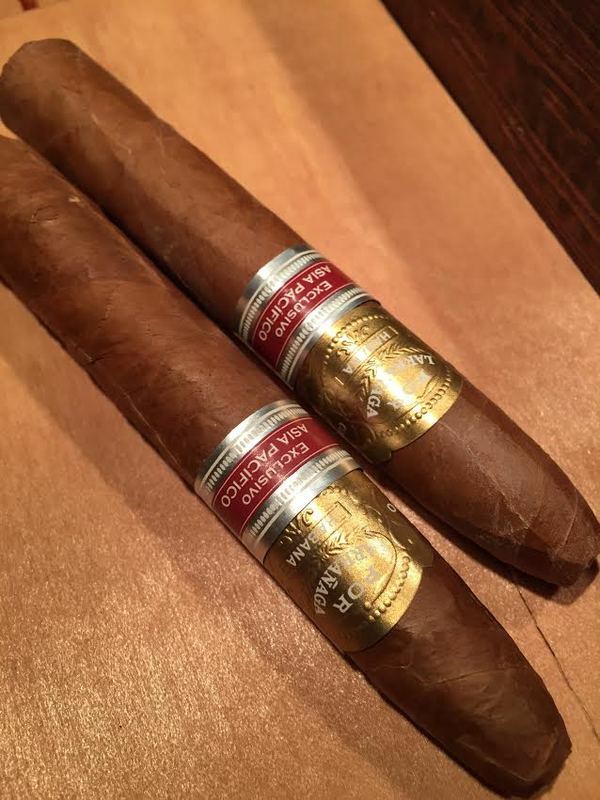 The R&J Edicion Limitada 2014 is an elegant torpedo shape with a dark espresso like oil wrapper. The wrapper is fairly vascular and a little rough to the touch. This cigar has been aged two years prior to release but you couldn't tell. The newest release by SA Habanos EL's 160mm by 50rg. Typical Davidoff, perfect construction even color, and barely vascular. Fuente Fuente Opus X Angel Share Robusto ommemorates the one hundredth anniversary of the Fuente Cigar Company. It's a softer and less spicy version of the regular production Opus X. In the biggest and busiest city in the world it can be very difficult to find a quite moment to oneself let alone a moment of Zen. How to figure out if the cigar your purchasing is the correct humidity. When choosing a cigar from a Tobacco Shop, finding the prefect puro's can be tough. So many to choose from, brands, styles, sizes only further your indecision. One of the most important aspects to choosing a good cigar is how it has been stored. Correct humidity and temperature to a lesser extent however, is very important to how the cigar with taste, light and draw. Lets discuss these three points. Purotrader announced the launch of the initial phase of its’ trading platform which includes the virtual humidor, blog and discussion forum. The OpusX cigar is luxurious, opulent and arguably the most beautiful cigar brand on the market today. The wrapper has a rich reddish to golden brown hue with a slight oily texture. Construction is excellent and the pre-light draw exposes notes of Cayenne pepper. We are often asked about pricing rare and vintage cigars.. It’s a much more complex than it would seem. Through PuroTrader’s global network of collectors and retailers, we seek to create a more efficient global trading and exchange platform. This is no small undertaking; one must understand some of the bigger issues. The first and most important factor when trying to figure out correct pricing is supply and demand. While this seems obvious, there are many issues that abound. For instance, how many of a particular cigar was made that year? Often times the Tobacco House numbers their limited release cigars, however we have found that their number are not always accurate. Through our research we have discovered that some Tobacco Houses will create an undisclosed number of “extra” boxes without putting a serial number on it, therefore negating or hiding the fact that they produced more boxes than originally disclosed. The Davidoff 2011 White Edition is also known as the Super Belicoso and comes in white lacquered boxes of ten. Davidoff reportedly made 8000 boxes for worldwide distribution. Boxes are supposed to be individually numbered, however we have seen factory inconsistencies with serial numbers which leads us to believe there may have been additional boxes made. This Belicoso measures 5 1/2 x 52 and is made from tobacco aged 5 years. The Cohiba Behike (aka BHK) is the hottest and most desirable cigar on the market. From Rappers to CEO’s, everyone who is anyone wants to be seen with only the finest, and the Behike by Cohiba is the best in production and Cigar Aficionado's Cigar of the Year. Unfortunately being the best means counterfeit and Cohiba’s are no exception. They hold the title of THE most counterfeited cigar in the market place, and the BHK is rapidly falling victim to this fate as well. Cohiba tries to prevent this by creating an intricate and detailed band that incorporates using holograms and we detail the points that you should keep an eye out for! Choosing your first humidor can be a daunting task and should come with some careful considerations. Consider this an investment; like an important piece of furniture. Cost should factor into the buying process but remember this is not a disposable item and a quality humidor will last for generations. Owning a sharp, versatile jacket is essential to dressing well this fall because it is going to be the one item that pulls your look together effortlessly. Brave GentleMan offers one of our favorite biker jackets this season. One of the things we love about fall besides the amazing weather is the selection of jackets that is available to wear. One of them is the timeless jean jacket and it’s back this fall in a variety of silhouettes. Designers have taken the jacket and added a few things to it like mixed fabrics, a play on shades of blue, or texture on the jacket. Denim jackets were originally created for workers; they were a part of an overall denim outfit that was rugged and durable, helping to keep parts of the body safe, with Levi Strauss helping to shape their popularity as early as the early 1900s. To this day, denim jackets and their short jacket cousins continue to be an important part of fashion. Everyone from Abercrombie and Fitch to Rag & Bone and Dolce and Gabbana now offers a jean jacket year-round, though the latest trend calls for multiple colors and different levels of distress to create fresh looks. Invest in one and you’ll find that it’s not only for handling cool summer nights and breezy fall days, but an ideal layering piece to sit under long coats and tailored blazers when the temperature calls for it. Twice a year in February and September, the best and brightest American menswear designers gather across New York City to unveil their collections for the following season. Here, a look back at our favorite looks from the inaugural New York Men's Day event and other presentations, and a preview of the new leisure principle in menswear, relaxed shapes, bold stripes and colors to wear next spring.